My last donut creation turned into a fiasco! Since then I have avoided making donuts. But I’ve been searching to make a recipe that would satisfy my sweet tooth all while being healthy! 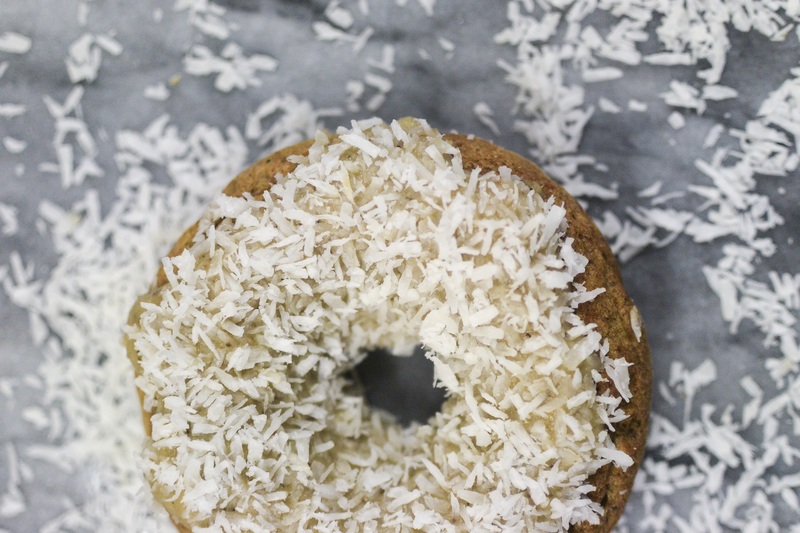 The idea of the protein gluten free, refined sugar free donut came to existents! 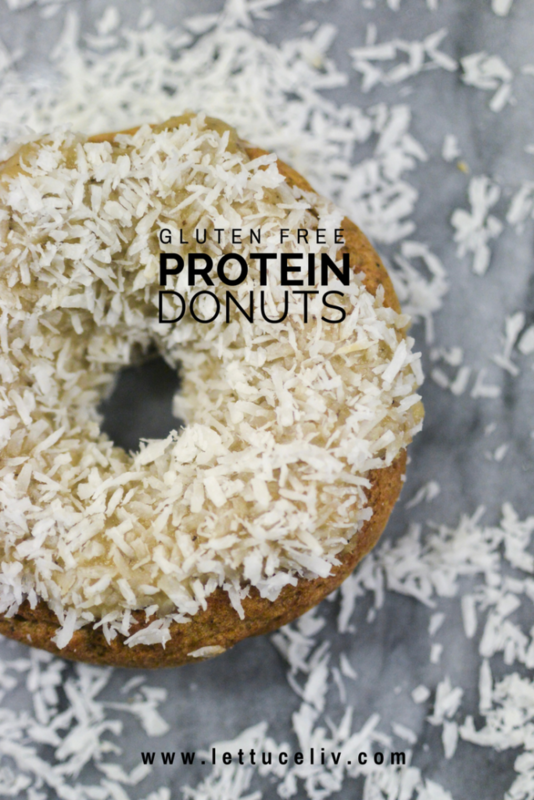 These Protein Donuts are super easy to make and are actually really tasty so you can enjoy all the goodness of a donut without the guilt! 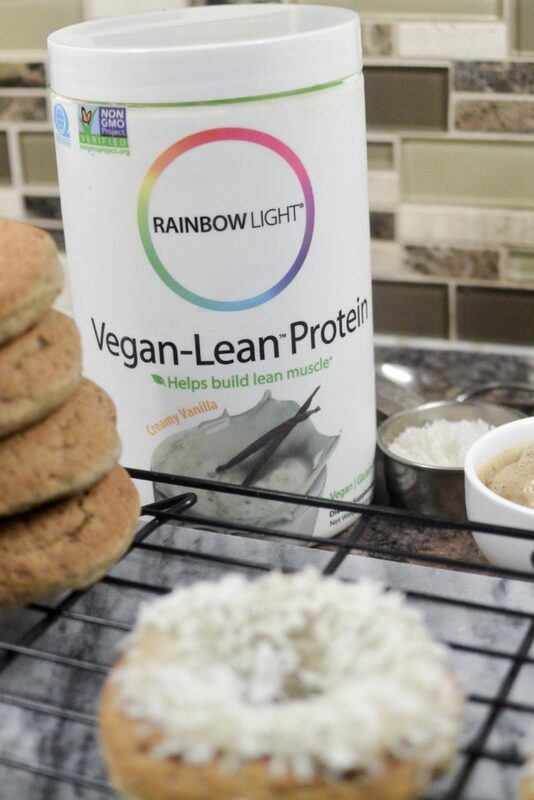 The protein powder I used is from RainbowLight Vegan-Lean Protein in Creamy Vanilla . This brand is well known for making high quality vitamins. and I love that this protein powder’s formula is 100% vegan and is formulated with digestion and absorption enhancing enzymes. What does this mean? Well it means that this protein powder is made to maximize the vitamins, minerals and proteins that our bodies absorb and certain minerals are heavy for our bodies to digest (gas and bloating) but this formula helps avoid all those issues! There are know two gluten free flours alike. And I find with each batch they also vary, this recipe may or may not call for some extra water in your batter. Start with what my recipe called for 1/2 cup and take it from there. I skipped ahead the recipe for protein donuts is fairly simple and is actually based from my banana chocolate chip muffin recipe. I used gluten free flour, steel cut oats flour. Two scoops of my protein powder, chia egg and banana to bind the ingredients. I used raw coconut nectar but you can also use maple syrup. Coconut oil or vegan butter, water and baking powder. I also added some cinnamon, nutmeg and allspice. I did this because I love cinnamon! That’s it for the donut. I also made a refined sugar free icing for the donut, which is also super easy to mKe. You’ll need dates, shredded dried coconut, none dairy milk and coconut oil. To make steel cut oat flour is very simple. take the steel cut oats and place it in your high speed blender. Blend until milled to powder form. Easy! Mix all the wet ingredients and then add them into the dry, beat until well mixed and there are known lumps. I used an icing bag to pipe the batter into the donut tray this way it would cook smooth and pretty! Bake for 35-45 minutes. Enjoy with the yummy date icing! Make chia egg by adding 1 tablespoon of ground chia to 1/3 cup of water. Let it sit until it has a thick egg like consistency. Add in liquids, to the dry and mix well. In a food processor add in all the ingredients, dates, shredded coconut, coconut oil and pulse. Slowly add in almond milk making sure the frosting isn't to watery. Once creamy set frosting aside and store in the fridge for 20 minutes. They look so yummy! I especially love the glaze! 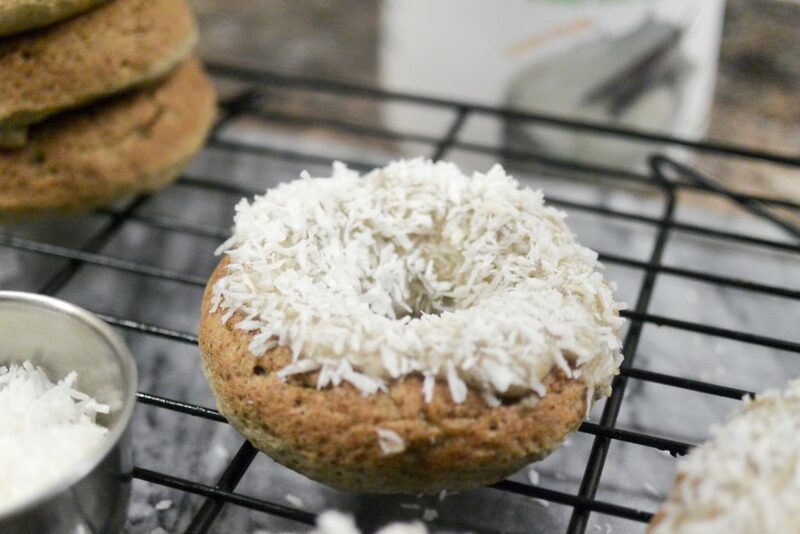 I was on a donut craze this summer but then totally forgot about them… I need to make some soon! Oh those look good. I don’t eat donuts often, but when I do I really enjoy them. These look fab! Guilt free doughnuts? Yes please! They look incredible. Life is far too short to feel guilty about eating food, especially doughnuts! LOL! These sound amazing. I will be making this for sure! Thank you for sharing. These look delicious! I love making donuts and am adding this recipe to my list. Thanks for sharing! These look so yummy – I love donuts, but they are so bad for you! I’m down for a healthy version! These look delicious! I have Rainbow Light vitamins, but didn’t know they made a protein powder. I’ll be looking for it on my next trip to the store. The icing also sounds really yummy! I’m planning on baking donuts soon, I love the addition of protein powder! Amazing!! I hope they turned out for you! 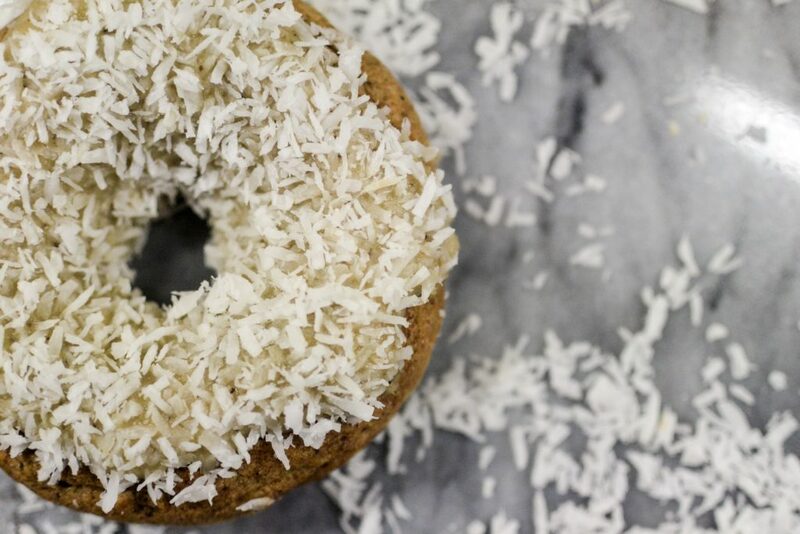 You had me at donut and healthy. I sha’ll be making these. Plus my four year old is obsessed with donuts to the point I have to hide from driving around the donut shops. Omg that’s hilarious!! I would so make this for your little one and maybe hide in some veggies inside the donut! You can make it without adding the protein powder but instead something else too!!! 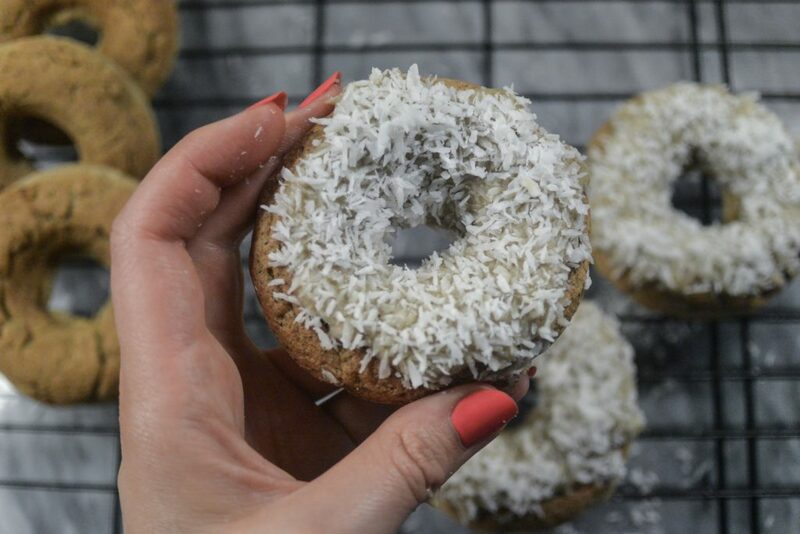 You had me at healthy donut 🙂 also I’ve heard of that brand for vitamins but haven’t seen this vegan protein powder and am totally going to look next time I’m in the vitamin shop 🙂 thanks for sharing–these look amazing! I know I’ve found the protein powder at whole foods, but not everyone has it!! A healthy donut?! I am IN! Yes!! I hope you were able to make it. How did you find it turned out? I’m glad these turned out better than your last attempt! They certainly look good, the coconut on top is a nice touch! Thanks so much Beth! Yea I don’t know if you read my first donut attempt ahaha but at least that one ended up as a tasty pie !! I used to use RAINBOW LIGHT all the time – I need to try them out again! I sort of forgot they existed thanks to all the other proteins on the market these days! I love rainbow light I also take the vegan vitamins! My husband also uses it too!! I love donuts! I have to try this recipe and hopefully it turns out ok since I have never made donuts before. I love that you used ingredients that has coconut in it. Yes! I hope it turns out good for you also. My first attempt at making donuts turned out horribly! But now this recipe is fool proof!